First of all, thanks for visiting our website. Unfortunately it is not possible for us to translate the complete website in English. But we are working on it. Ever thought about how big your family actually is? Where are our roots? One of the goals of the Van Namen Foundation is to construct a global family tree out of pieces supplied by family members. If you have information available about your part of the family tree, we would really appreciate if you help us build the world wide tree of the family "Van Namen". Which surnames does the Foundation cover? Do all individuals with those surnames share one common ancestor? Can I access your genealogical database? 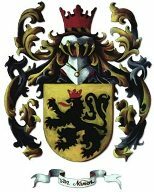 Does the family have a coat of arms or family crest? What does the name 'Van Namen' mean? Are there any famous family members? What is the significance of the town of Namen and where is it? In what other areas are family members historically concentrated? Are there many family members in North America? What about the other traditional immigration countries? Are you related to families with names like Vanaman? Will you translate the website into English? Can I assist the work of the Foundation? Does the Foundation organize family gatherings? This website is the main page of the Van Namen foundation. The purpose of the Van Namen Foundation is research and document the genealogy of the Van Namen family. We have encountered many variations in historical records. These include: Van Namen, De Namur, Van Name, Van Naame, Van Naamen, Van Naamen van Eemnes, Van Naamen van Oversteeg, Van Naamen van Scherpenzeel, Van Namer, Van Nemen, Van Naman, Van Amen, Van Emen, Vanaman. We are not sure, but it seems to be. We cannot prove it yet, but strong circumstantial evidence points to the existence of one common ancestor. One of the major objectives of the Foundation is to amalgamate and integrate the several distinct lineages that we identify at the moment. Yes, unfortunately it is only available in Dutch. You can find the family trees here. We don't know yet. But it refers to the place Namen(Namur), Belgium. Our lineages go back to 899 AD but they are incomplete at the moment. The complete lines can be found at this page. The earliest family member we have in our database is Berenger van Namen, who was born around 899 AD. We know of individuals in South Africa and Indonesia, but believe their number is very limited. No we are not, but we have researched it. If we have time for it we will. At the moment we have limited funding and still a lot of research in the archives. But we are working on it. You can always mail if you have any questions. Only a few. You can search for it. Yes please! As a purely voluntary organization we can use all the help we can get. You can help us by supplying genealogical data and by sending us family stories, images of original documents and photographs. And of course you can assist us by giving the foundation a financial contribution. Although all the work of the Foundation is done by volunteers, we inevitably run up some costs, of which this website represents the most significant one. Not at the moment but we are working on that to.